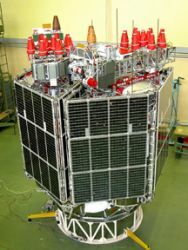 (UPDATED FEB. 1, 2010) Russia got its GNSS program back on track with the December 14 launch of three modernized GLONASS-M satellites — resuming a schedule interrupted by problems with a navigation payload on an in-orbit spacecraft. A Proton launcher took the trio of satellites into orbit at 1038 GMT (5:38 a.m. EST) from the Baikonur Cosmodrome in central Kazakhstan.The first of the new spacecraft began transmitting signals on January 10. Another went live on January 24 and the third was declared operational in a February 1 ITAR-TASS press release. Last year, a problem caused by the signal generator in an on-orbit GLONASS-M satellite (#726) led the Russian space agency (Roscosmos) officials to delay a scheduled September 25 launch of three new spacecraft. Placed in orbit on September 25, 2008, and transmitting on GLONASS RF channel -3 since November 13, 2008, GLONASS #726 is located in plane 3, slot 22 of the constellation. The problem with the signal generator was detected in last August, and the spacecraft taken out of service on August 31. With three spacecraft off-line for maintenance, including #726, GLONASS had 16 operational satellites out of 22 in orbit — although one of these is in the process of being decommissioned. Another launch is expected in February 2010 and then two more later in the year.. The Fourth International Satellite Navigation Forum and an International Congress and Exhibition of Navigation Systems, Technologies and Services will take place at the ExpoCentre Fairgrounds in Moscow, Russia from June 1 through June 3. The conference focuses on GLONASS, the Russian GNSS. Discussions include technology, legal issues, new products and services, and the system’s introduction into the Russian economy.